Now I know this list will generate a lot of controversy because , let's face it , everyone has their favorite breakfast place . And whether it be an adorable 4 table homey cottage , an old-fashioned silver diner or a huge breakfast hall , everyone will " fight to the death " that their breakfast joint is the best . For this list I concentrated on places that serve FULL breakfasts , you know , eggs ( in any form ) , meats ( bacon , sausage etc.) , breads ( toast , English muffins etc . ) fried potatoes and pancakes . I know they'll be many I missed ( so tell us your favorite ) but these are some we visited and enjoyed very much . Don't forget , click on the links for the full reviews . 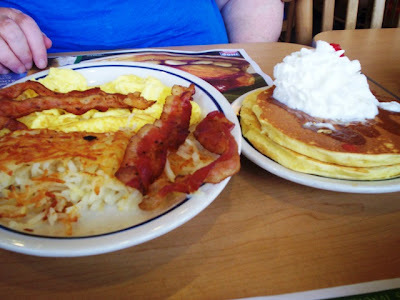 IHOP - ( CHAIN ) -----We visited the one at 47 FAUNCE CORNER ROAD ,DARTMOUTH , MA. 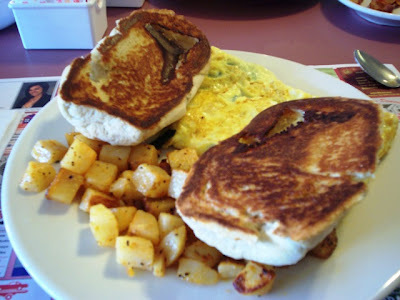 -------Their breakfast combos are enormous , and delicious . I love the coffee pots on the tables and the selection of syrups . We often try their specialty pancakes when available and their everyday specials . HUGE menu , healthy options and decadent combos . LOVE going here . PANCAKE MAN - 952 RT.28 , SOUTH YARMOUTH , MA. -------Big open restaurant with lots of seating . Good sized menu with all the typical breakfast favorites . But people come for the pancakes . They're big but light and even though they're 4 to a serving , you don't feel over-stuffed . Many add-ins like chocolate chips , walnuts , apples etc. And make sure you get the thick apple-wood smoked bacon - to die for . POGO'S BREAKFAST AND CAFE - 2107 PLYMOUTH ST., EAST BRIDGEWATER, MA --- I had probably the best and most unusual breakfast here . First let me tell you the potions are HUGE. How huge you might ask. So huge you might take some home . YES - take breakfast home . Laura did . The aforementioned breakfast ---the tiramisu French toast --unbelievable . 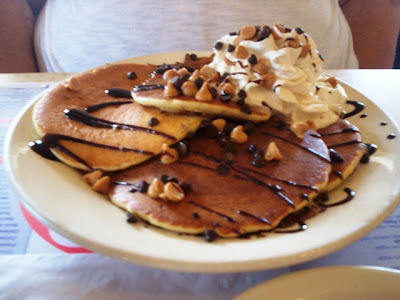 Let's just say they start with chocolate bread , and there's whipped cream , chocolate drizzle , chocolate chips and more . Look at the above picture . They also have numerous selections of omelets , eggs Benedict , pancakes and on and on . Everything is unusual , delicious and a tribute to their gourmet chef . Go soon . 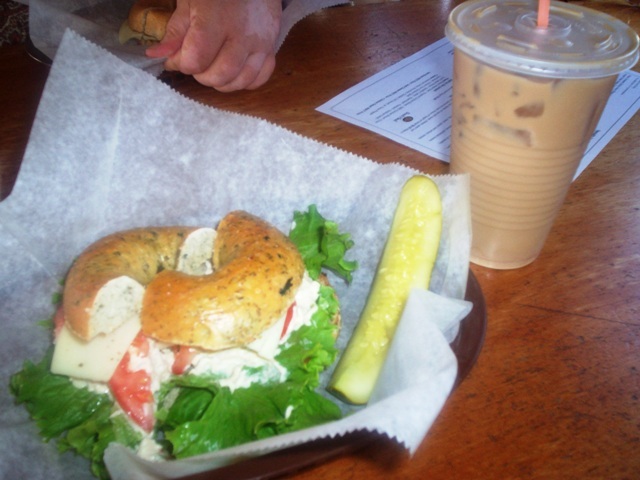 BAGEL EXPRESS CAFE - 938 LEE'S RIVER AVE. , SOMERSET , MA. ------ Real train - real good breakfast sandwiches . If you sometimes want your whole breakfast right in your hand , you might consider getting a breakfast sandwich . But if you're sick of the skimpy ones at the fast food places - try this spot . The bagels are fresh daily ( from the fantastic BRISTOL BAGEL WORKS ) . The eggs are fresh and cooked to order , the bacon thick and smokey and the meats and cheeses freshly cut . This is a delicious sandwich . Add one of their gourmet coffees and you have a satisfying and tasty way to start your day . CYD'S CREATIVE KITCHEN ----2331 ACUSHNET AVE . , NEW BEDFORD , MA. Cyd's is an open , airy neighborhood favorite . 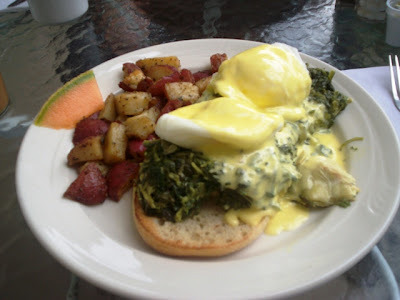 Bright with lots of seating , it has a large menu with all manner of breakfast goodies plus a few local specialties . This was the first place I saw JAG on the menu . It's a spicy rice dish . They also make cheese rolls . They're delicious sweet rolls with cheese baked right inside . You can have them instead of toast or English muffins . I've been here a few times now and always look forward to coming back . JOE'S RESTAURANT ----366 MARIANO BISHOP BLVD . , FALL RIVER , MA. A local favorite . 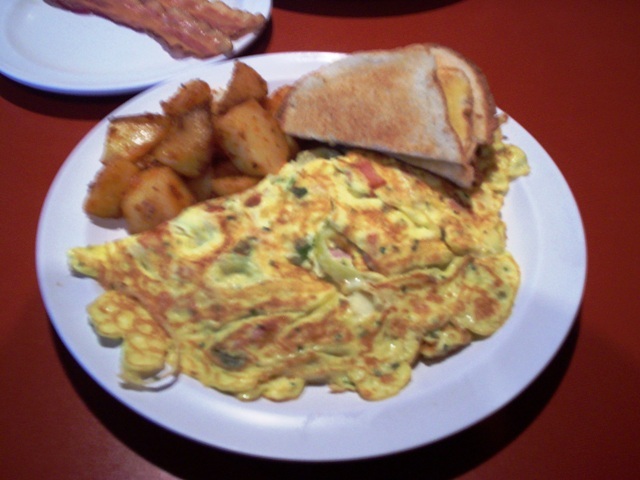 Joe's is my go to place when I just want to go out for a good breakfast . Great omelets ( I love the chourico ( spicy Portuguese sausage ) and cheese ) while Laura goes for the Fall River special ( chourico , peppers , onions - very spicy - makes her sweat - LOL ) .They also have great combos with specialty pancakes , even Belgian waffles . And the prices can't be beat . Great prices , great food , friendly waitstaff ---that's why I keep coming back to Joe's . 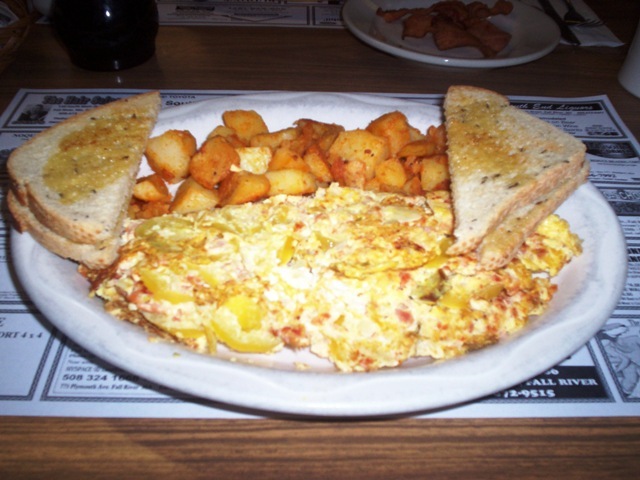 ROSARIA'S DINER --- 591 RODMAN ST. , FALL RIVER , MA. This is such a cute little place . I was very impressed with how immaculate and nicely decorated it was . Plenty of seating but widely spaced --so you can hear your own conversation and not your neighbors . 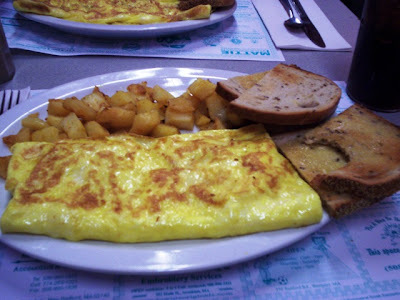 They have a nice menu ---all the egg , omelet , pancake and usual breakfast sides . But they also have some unusual items like , cacoila ( marinated pork ) and linguica ( a milder chourico ( Portuguese spicy sausage ) . They also do their pancakes an unusual way . You can order 1 of each of their many choices of pancake . You aren't stuck with 3 the same . I ordered 1 each of peanut butter chip , chocolate chip and maple walnut . They were fantastic . So is everything else I've tried here . This place will become a local legend soon so get in while you still can . THE BARN RESTAURANT ---- MAIN ROAD , ADAMSVILLE , RI. Want to see a woman walk with a tray of juice glasses on her head ? YEAH ? Well get yourself over to the BARN RESTAURANT and you'll see the hostess do just that . This is an upscale ( prices reflect it ) spot in a beautiful setting with a touch of whimsy in their terrific breakfast menu . Check out the link to see their unique omelets , johnnycakes , egg sardou and many other really different takes on the usual breakfast fare . It's an experience and it's worth the extra cost . This is where the regulars and the " summer " people come to sit outside and relax over their coffee . Come enjoy the ambiance . 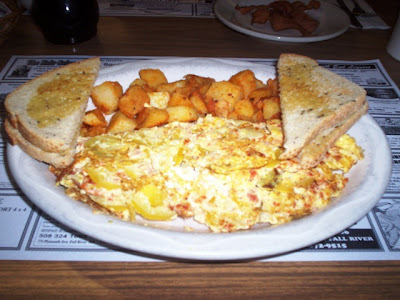 ALMAC'S DINER -----135 PRESIDENT AVE. , FALL RIVER , MA . This is the place , the legend , the spot politicians come when they want to be seen . ALMAC'S has been an institution in Fall River for longer than I can remember . It's a traditional dining car and so famous it even has it's own souvenirs .But on to the food . EVERYONE has had breakfast here at one time or another . Some days there's a wait to get in . What are they waiting for ----eggs , fried potatoes , bacon , sausage , ham , toast and throw some pancakes in there . ALMAC'S has all your breakfast desires covered and they're all done perfectly . Just good ol' breakfast - done right . Stop in , you won't be sorry . 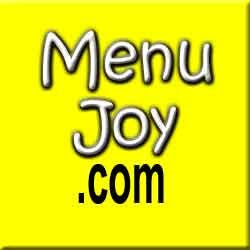 And don't forget to check out our friends at MENU JOY for a great list of area menus.